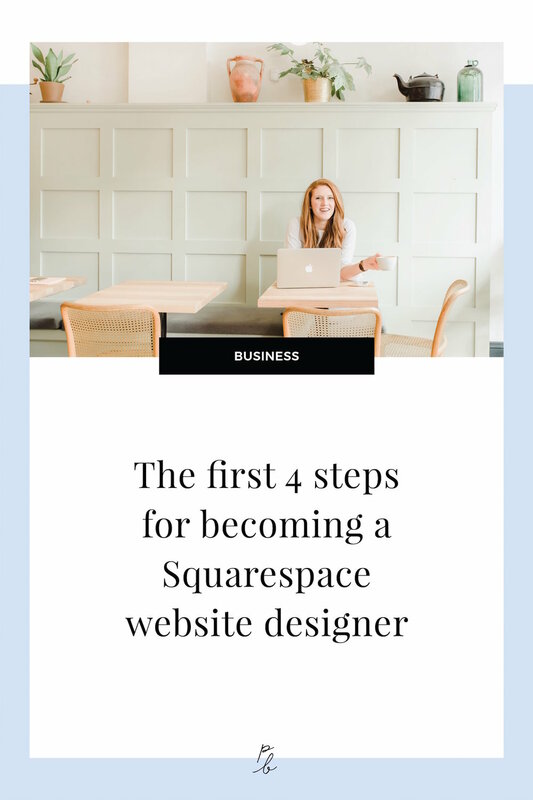 In the most recent launch of my Square Secrets course it felt like everybody and their brother started asking questions about if the course was a good fit if they wanted to learn the skills to become a Squarespace website designer and my answer was absolutely yes! Those questions got me thinking about what advice I'd give aspiring Squarespace website designers and I compiled my advice into a video which you can watch below, and I'll also summarize my thoughts here in written form! It's going to be a long uphill battle to try to lock down clients with absolutely no past work to show them, so it's best you start off by creating a few sites to add to your portfolio. Now, I totally get the conundrum you're in. Just like the 'past work experience' issue of new grads who need experience to get a job but need a job to get experience, I get that you're in a similar predicament with needing clients to create a portfolio of work but you need a portfolio of work to get clients. I can guarantee that someone in your life, a friend or family member or distant relationship needs a website. Now it's known I design websites, I swear people come out of the woodwork constantly asking for info/help. Multiple past sorority sisters, an uncle, a bunch of people I went to high school with and many people I worked at past jobs with have all asked me about websites. A lot of these people are kinda hush-hush about their new business or blog idea as they're just getting started, so I would have had no idea they were starting something or needed a website normally. I just know there's someone in your life who needs a site too, so you've got to get the word out about what you're doing and can offer. Use whatever form of communication is available to you to tell family and friends that you're starting to become a web designer and you want to help people build sites. Build a few sites, say 2-3, to start your portfolio. You don't need 50 sites by any means, just a couple. If when you start reaching out to people explaining you can help them build a website you find you have 50 people who need websites, choose to work on the projects that most closely align with the types of projects you want to take on as a designer in the future. If you have a feeling your ideal clients are going to be creative entrepreneurs, build a site for your portfolio for a creative entrepreneur as opposed to a school, non-profit or corporation. Let's be real, you need to feel confident that you can actually provide the service you'll be offering, so that's step 2. Just like horses can apparently sense your fear, clients can tell when you're only halfway sure you can competently complete the work they need done. The next step to becoming a Squarespace website designer is to actually believe in your gut that you can do it. There's many ways to build your confidence. Building that portfolio of work is one fabulous way to do this. You could take a Squarespace course, such as my Square Secrets course, you could binge watch all the Squarespace YouTube videos available, nerd out on blog posts, scour forums, etc. The method(s) you choose to build your confidence is totally up to you, but you've got to do something. Build some sites, build your confidence, read Jen Sincero's You Are A Badass (<- that's an affiliate link), do whatever it takes to feel like you're a website building rockstar so you feel ready to charge for your services. Yes, yes I know picking a niche sounds like a real-life nightmare to you at the moment and you want to help ALL THE PEOPLE and not make the pool of people you could potentially work with smaller. But, when you go to hire a website designer, you don't want a website designer who is decent in 10 different things, you want the website designer who is the expert on the thing you need. Fabulous example is Connie from pixalitydesign.com, she helps people in the health and wellness space build Squarespace sites. When you niche, you make the decision to hire you a no-brainer for your ideal clients, and that's why it's beneficial to choose a niche. When you niche, you'll also learn how to use the related softwares well that are required add-ons to your website projects, and learning one software that you can use on all clients sites takes a whole lot less time than learning a new software for each different website you build. Examples, spas need an appointment scheduler integrated into their site. Schools may need a portal for parents to login on and if you need to learn a new skills or software to make that happen, it extends the amount of time you need to spend on the project. Niching makes you an easy yes to ideal clients and makes you more efficient in your site builds. I've tried many forms of calls to action to get potential clients to inquire with me and the most effective method I've found is to get them to book a free consultation call with me. People, rightly so, have lots of questions about their new website project and they'll want to get to know you and determine if you're trustworthy, skilled and the right fit for their project. A free consult call is the best way to achieve this. You can use the Acuity Scheduling block to make this functionality of booking free consult calls possible on your Squarespace website. Those are your 4 first steps friend! Now as I mentioned, there's many ways to build that confidence in your Squarespace skills, and one fabulous way is to take a course. If you'd like my years of Squarespace knowledge all packaged up into one course, then Square Secrets is for you. Many past students are now making additional income designing websites for others, and if you join, you'll be in very good company of others who are looking to become a Squarespace website designers too.